It began with New York City back in 2016 with the debut of its open-world shooter, The Division. For the game’s sequel, out this March, that ambition was even grander: a 1:1-scale Washington DC. Every ward, every district, mapped out and built to be fully explorable in-game. Over 68 square miles carefully replicated to mimic its real-world counterpart. Constructed and then systematically destroyed, street by street. The studio envisioned an American capital heavily scarred by a trio of world-altering events: the viral outbreak that ravaged its populace, the subsequent seven-month fallout that crippled its infrastructure, and the invasion of rogue forces reshaping what remained. It was a tough proposition. But the challenge was necessary: The Division’s gameplay needed a switch-up. So, as with NYC, we have residential and commercial zones. But these are joined by government districts, nature spots and suburbs. And that visual variety feeds directly into gameplay. You’ll need to adapt your tactics depending on the zone you’re fighting in as you try and liberate settlements and reclaim key locations. Your approach to the White House, which forms the game’s opening, is a straight running battle up the iconic building’s lawn. In contrast, the two-mile stretch of the central Mall is open territory with attacks coming from all sides, so sniper rifles are all-important for taking the upper hand. Different again are the tight corners and claustrophobic European-style streets of Georgetown, which makes the shotgun the weapon of choice. The game’s enemy AI has also been adapted to take advantage of these different spaces, promising a richer range of engagement scenarios this time around. You’ll face off against a trio of factions. Hyenas: drug-fuelled chaos-revellers preying on the weak. True Sons: a militia who rule by brute force. The Outcasts’ premise is intriguing: infected individuals were left in the city’s makeshift encampments to die. Those that survived have banded together and are now out for vengeance. A fourth faction, the Black Tusks, could pose the biggest threat. 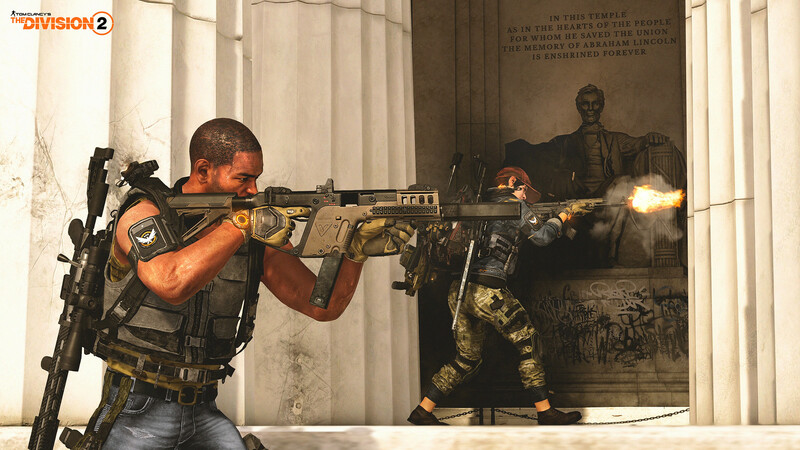 As well-equipped and organized as Division agents, this organization will be introduced as part of The Division 2’s endgame, laying siege to city areas at random. The initial build of Washington DC in-game was the easiest part of the process. The studio used ordnance survey information to efficiently digitize the base layer of the city, saving hundreds of man hours. The director references a “world bible,” around an inch in thickness, that’s the accumulation of the studio looking at every district, street and building and asking the same question: “what happened here?” Every corner has a story. That’s true of every district — including the game’s new Dark Zones. DC’s trio of Dark Zones are no less foreboding, but are positioned at the edges of Washington DC. A relocation partly to stop DC being split in two (potentially aggravating non-PvP parties trying to cross town) but to also strengthen the sequel’s new gameplay flow. PvE missions will slowly guide you in a full circle around the city, eventually leading you past these walled off areas — and hopefully tempting you inside. As with the wider city, the location for each helped shape their backstory and the gameplay experience within. Union Station to the east was the site of DC’s patient zero and is filled with government and army equipment. To the west is affluent Georgetown, with hastily-built walls that kept the general populace out but not the infection. Trek south and you’ll hit an area just recovering from flooding and being targeted by weaponized chemicals. Ubisoft Massive is keen to balance the macro with the micro this time around. Side missions will bring these human interest stories to the fore, building your personal relationship with various pockets of the populace. It’s an emotional hook the studio hopes players will engage with: rescuing a kidnap victim will be as important as rebuilding an organizational infrastructure. Everything in The Division 2 is intertwined. Aiding settlements helps you reclaim the city. Washington DC’s topography enriches gameplay. Mission design guides you on a lap of DC. Ubisoft Massive constructs and destroys a city again. 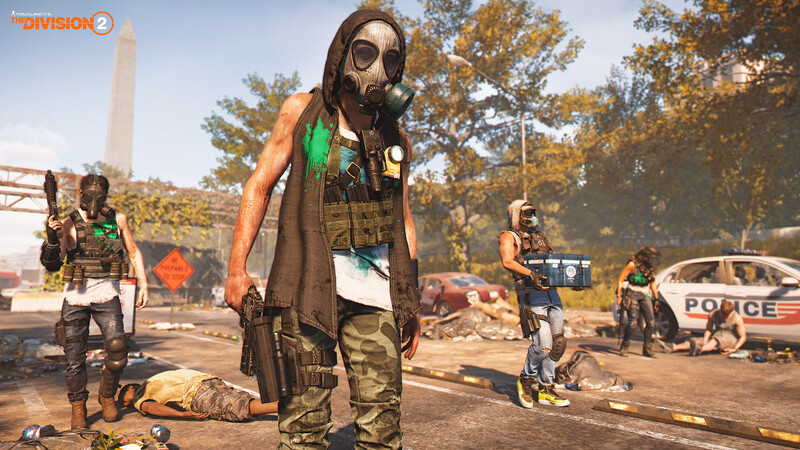 All with the intention to make The Division 2 a superior online shooter to its predecessor. Tom Clancy’s The Division 2’s private beta launches today. The full game will release on March 15.